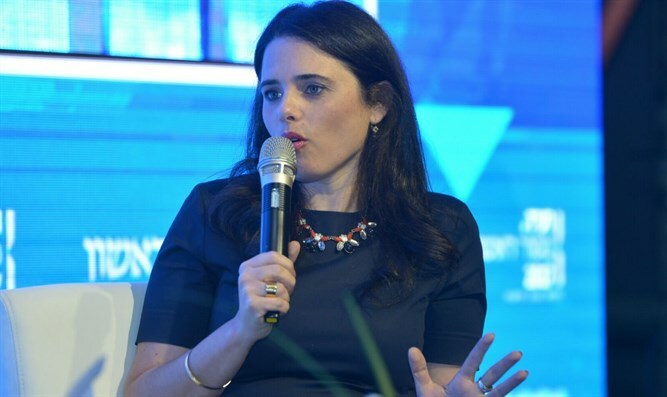 Minister of Justice Ayelet Shaked (Jewish Home) referred to the possibility that the Tekuma party would split from the Jewish Home and run separately in the coming elections. "I think we should stay as one party, there is no place for two parties in the religious [Zionist] sector, and it's more important to be strong together," she said at the Makor Rishon conference in Tel Aviv. She referred to the issue of conversion and said that there is no real need for the conversion law approved last week by the Ministerial Committee on Legislation. "The High Court has been pending for 12 years on the Reform movement. On this issue, the way is dialogue, not legislation." Regarding her relations with Supreme Court President Miriam Naor, Shaked said, "My relations with Miriam Naor are very good, we have disagreements, some of them are resolved between us and others float above the surface." Shaked explained why she chose Avichai Mandelblit as Attorney General. "He has experience and he is a very professional person who makes decisions professionally and not according to demonstrations in front of his home," explained the Minister. Another issue that arose in Shaked's on-stage conversation with Makor Rishon editor Hagai Segal a the the conference was the legal handling of incitement and terrorism on social networks. "We have good cooperation with Facebook regarding removal of terrorist content. With Twitter, on the other hand, someone has to wake up, the wantonness there continues unabated and a serious change is needed," said the Justice Minister.